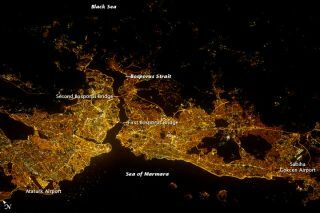 The city of Istanbul glows brightly at night in this photo taken by an astronaut aboard the International Space Station on Aug. 9, 2012. The two halves of bustling city where East meets West shine brightly in a photo taken by an astronaut aboard the International Space Station on Aug. 9. The Bosporus Strait famously separates the two halves of Istanbul: Its European half lies to the left in the photo and its Asian half to the right. The Bosporus is a busy 19-mile-long (31 kilometers) waterway through which ships pass between the Black Sea and the Mediterranean. Ferries also run between the two halves of the historic city, which was the capital of many ancient empires. The First and Second Bosporus Bridges can be seen spanning the strait and connecting to the halves of the city. Dark areas on the outskirts of the city are wooded hills.